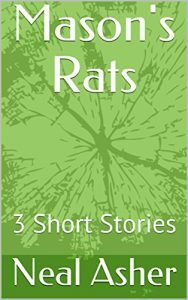 Mason has a rat problem on his farm, a serious problem, for these rats are armed and dangerous. But he soon learns that rats in suits are even worse. What do you do when rats invade your barn? Kill them or negotiate? Mason finds out the hard way that force does not always work! An allegory of war and violence? A statement on the arms race? Neal Asher’s work takes Orwell’s Animal Farm into a grimly humorous future where evolution is outrunning humanity. You may never trust a rat again! is correct to clamp down upon (although inflammatory statement regarding ‘bogus’ asylum seekers by British politicians and press certainly do not meet with my approval). Unfortunately, however, although Mason’s Rats III can certainly be read as an example of a company fighting to hide its illicit workers from an inquisitive authority, there is very little in the way of actual criticism of this practice, and hence the story falls short of its potential. Of course, the central reason for my interpreting this story according to political allegory is based upon the notion that this volume is a deliberate encroachment on the territory of Orwell, which I think is pretty valid assumption given not only the book’s blatant style but also its back cover blurb. It is, however, also very possible to enjoy this trio of short stories purely ‘as is’, and in this context I would have to note that they are, without exception, simply written and unpretentious little tales which zip along at a fair old pace and provide the reader with more than a few wry smiles. It is quite nice, for once, to read a book which does not contain the padding so commonplace in modern publishing — the ideas here are enough to properly fill 34 pages, and so that’s exactly what Asher chooses to do. Were this topic to be expanded to a 400-page novel, I feel it would lose it point and its impact amongst the daed forest of extraneous pages rather quickly. The back cover asks whether Mason’s Rats is “[a]n allegory on war and violence? A statement on the arms race?” Personally, I find it quite difficult to focus upon these tales as either of these, but as I have already shown, that does not mean I think the contents herein to be completely devoid of meaning. Although this volume is a small press item (to get hold of a copy, the best place to look would be BBR Distribution at http://www.bbr-online.com/catalogue/, since both Kimota, the publisher, and Amazon seem to have run out of copies), Neal Asher is certainly not a writer who deserves to be condemned to such limited exposure. Indeed, his first full-length professional novel, ‘Gridlinked’, has just been published by Macmillan. On the basis of this slim volume alone, I intend to read it. Recommended.